Crab is plentiful around the British and Irish shores and is possibly the most underrated of our native seafood. 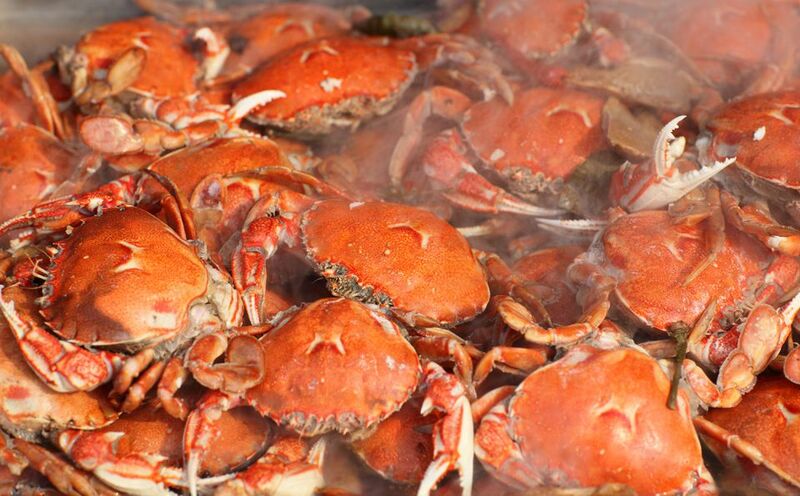 A fresh, meaty crab is just delicious when eaten fresh, and for us, by the sea. One of our all-time favorite sandwiches is at the Ship Inn, in Northumberland. The delicate sweet white meat, when tucked between two slices of thinly cut buttered brown bread, is the stuff of dreams in its simplicity and flavor. How to prepare (dress) a crab is relatively straightforward and quick to do. You can ask a fishmonger for a dressed crab, but it is cheaper to do it yourself. Preparing the crab after cooking is very easy. Place the crab on its back onto a large chopping board and snap off the tail flap, legs, and claws. With a fresh crab, this should be very easy. Carefully push a chef's knife or large knife between the shell and the body of the crab, twist and the shell should open. Inside you will see the 'dead man's fingers' (off-white spongy gills) which must be removed. Then remove the stomach sac and hard membranes inside the shell. Using a teaspoon scoop out the brown meat, place in a small bowl and mash gently with a fork. Remove any white meat. You will need to root around in the nooks and crannies to find it all. Keep to one side. Crack each of the legs and claws and pick out all the meat. Once removed check through the flesh to make sure there are no splinters of the shell. Return the brown meat to the center if the shell and the white meat to each side. Then stand back and admire your work. Serve with a good mayonnaise, brown bread, a wedge of lemon and a little finely chopped parsley if liked.